Inoffensive and sweetly trashy, we didn't mean to watch all of Rishtey (Bonds)... but we ended up sticking with this film to the very end, cheering our beloved Anil Kapoor on as he boxed against an evil, towering white man named "Scorpio" (or, as Scorpio himself would prefer, "SCORPIOOOOOO! RAAAH!") in the film's finale. What can we say? Watching Anil Kapoor perform is like receiving a direct injection of opium to the heart. It's addictive, and we LOVE IT. There were other addictive ingredients to Rishtey - plot twists reminiscent of the lovely Aa Gale Lag Jaa or the gloriously pulpy Calcutta Mail - as the film follows the beleaguered, working class Suraj (Anil Kapoor) in an extensive and violent custody battle against his evil, rich in-laws (led by Amrish Puri, of course). Suraj's brainless, estranged wife, Komal (Karisma Kapoor, lacking a lot of charisma indeed), gets entangled in her evil father's evil attempts to keep her apart from her loving husband and son because, as he sees it, it's better to be dead than poor. The film and we, the audience, naturally side with the poor all the way through - for example, Komal's family pad is a cheesy Art Deco mansion (yuck! ), while Suraj and son live in maybe the coolest slum/chawl neighborhood ever (complete with Ferris wheel and a step well! in the middle of Mumbai!). Clearly interior decoration is a sign of moral righteousness, and tackiness is far from godliness! Throw in one PPCC audience stand-in, a plucky working class fish-seller, Vyjanti (Shilpa Shetty), who falls for Suraj big time and begins to see Anil's smiling face superimposed on random babies and butter-churners (insert your own comedy sequence here), and you have an enjoyable junk food film. The best-made Custody Battle Hindi film, we reckon, is 1973's Aa Gale Lag Jaa (Come and Embrace Me), whose glorious gloriousness relies on the son and father's matching cutenesses. Master Tito and Shashi Kapoor were at the height of their adorableness in 1973 - and, heck, even the evil, rich father-in-law (Om Prakash) and easily-confused wife (Sharmila Tagore) were sympathetic. Rishtey, unfortunately, is peopled by less charismatic types, all of whom are in their decline. Indeed, the entire film's quality rests on Anil Kapoor's shoulders. Thankfully, we love Anil Kapoor - BIG TIME - and we think his particular post-2000 brand of barrel-chested, mustachioed, father-as-superhero charisma is perfect for a role like this. "Go, Anil, go!" we cheered, as he punched goons into orbit while bellowing No one touches my son! "Awww!" we sighed, as he wept over the endless court cases and had various emotional breakdowns on the shoulder of his sympathetic Punjabi stereotype friend. Or Dad? Clearly Dad. Hello! There was also an appealingly stupid side plot in which poor old Suraj, who used to compete in World Wrestling Federation-esque boxing matches (rings of fire! pits of spikes! artificial rain! ), decides, damn it all, to perform one last time in order to get money to pay for the court fees. Or something. And all of this when, uh oh, Suraj's ancient injury from an old WWF match has left him with brain damage! "If you get hit right here again," the doctor informs Suraj, pointing to his forehead, "you may be paralyzed... or be left a vegetable... or DIE!" Of course, the evil father finds out about this and swiftly hires "SCORPIOOOOOOOOO! RAAAH! ", a mercenary American WWF wrestler (not Mickey Rourke... alas), to punch Suraj repeatedly in the forehead. Hmmm, a hardened ex-wrestler with a gooey center and Achilles-like weakness who, after familial estrangement, steps into the ring again for one final, possibly fatal fight? Clearly The Wrestler was a remake of Rishtey! We rest our case. Music-wise, Suraj and Komal's love anthem, Har Taraf Tu Hi, was well-filmed and catchy - we've been singing, "Hai... hai-hai-hai-HAI chaahata ho itna tujhe!" all the way to the elevator and local Indian restaurant, where it's been playing on loop as well. And Anil's school-boy haircut in the song? The jerky posing? The columns?! The priceless. And guess what sign we are? SCORPIOOOOOOO, RAAAH! Anil: plz make more boxing melodramas. Perhaps a remake of Crying Fist? We've already noted that Anil and Choi Min-Sik are the same person. 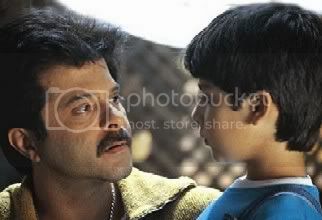 We love you, Anil Kapoor!!! rishteyy..typical early 2000's movie. it has its good moments and bad. the kid was cute, anil and karisma did their part. shilpa was kind of annoying. I like a few of the songs, they're catchy. And Abhay Deol can play Ryu Sang Beom's role!!!! Who played SCORPIOOOOOO! RAAAAAH! Bob Christo? Tom Alter? An unidentified (and stoned) extra? Oh dear oh dear. The picture of Karisma on the cover has kept me away from this before. I'm not sure if I dislike her so much because of something she does or because of the kinds of roles she chose/were available to her - when I'm sympathetic, I just think she was a heroine at exactly the worst possible time. I do love your theory on interiors and morality, though. I'll put a chapter in that on my tome on filmi homes. JJC - Yeah, it was comfortingly familiar ground. eliza bennet - Ooh, I looove Choi Min-Sik, though haven't seen nearly enough of his stuff. Thanks for the rec re: Failan! Now I must see it. memsaab - Oh, Memsaab! Can you imagine dignified post-2000 Tom Alter lowering himself to play a beefy WWF renegade? The guy looked a little bit like Bob Christo, but surely that can't be him (unless they've been keeping him in cold storage). Beth - Oh, Karisma was just awful in this - I suppose I can temper that with admitting her role was thankless - but I spent the whole time missing Madhuri! (Who wouldn't have tolerated any of Amrish Puri's nonsense anyway.) Interestingly re: Karisma, for the first time I started to see a striking resemblance with her grandfather - especially back in his skinny days. Fiji Indian - Thanks so much for the offer, but, alas, too late! I'm no longer in the country. Will try to contact you in case you don't receive this message.